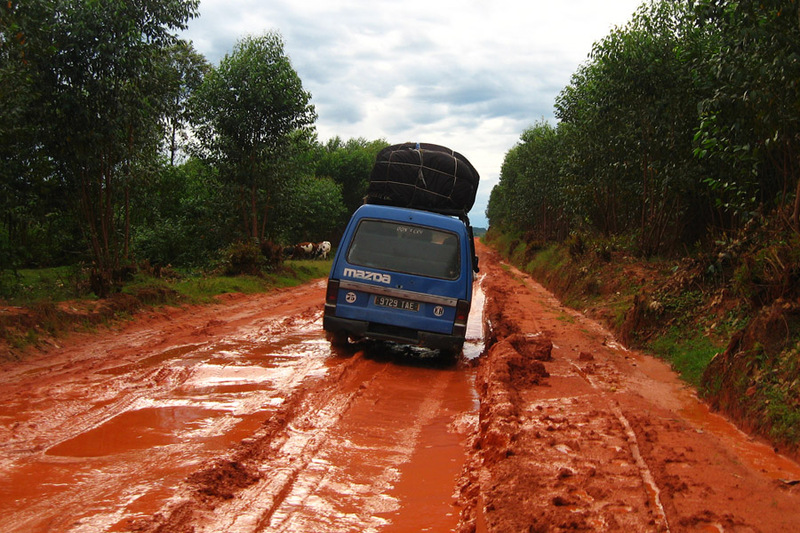 A “taxi-brousse” struggling along on one of the “easier” roads in central/north Madagascar. As we were eating dinner, Adam was discussing with our friend about making a trip to the South to teach some sessions at a discipleship training school early next year. 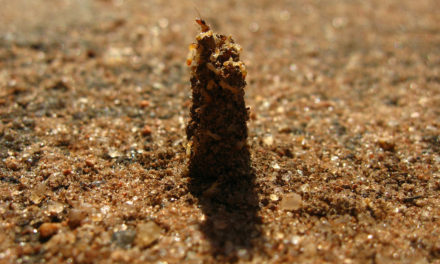 Our friend began to tell us about the perils of traveling to the south of Madagascar. If you take the bush taxi during the dry season, it takes about three days to arrive. And all the way you are very tightly crammed with six people in a row that’s really made for only four! But in the rainy season, it can take a week or more because the roads are not paved and the rain makes many of the rivers impassable. In places where they try to trudge on, they often get stuck in the mud and have to help push the taxi until it can go again. At flooded rivers where they know they can’t even try to pass, they just sit and wait…and wait with nothing to eat and drink but what they brought with them, until the torrents of water slow and they can attempt to drive or push through. It was on one of these taxis that one of our friend’s co-workers was traveling. He told our friend that on this particular journey they became stranded for a long time far from any available food or clean water. One older lady had finished all the food she had brought with her and eventually died from starvation. 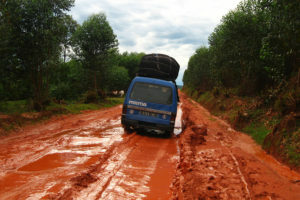 Our friend told us that he’s heard many more similar stories about the journey south during the rainy season. During the couple of weeks that they stayed with us, we learned more about what our friends had been up to for the last year and a half. They had been living in the South and working with a Christian organization there that taught people life skills. The organization, including our friends’ living allowance, was funded by a British charity. Everything was going well until they were told by the group in Britain that there was no more funding due to the world economic crisis. However, our friends continued to work for the organization as long as possible, even after funding was cut. Times were very hard. Their savings ran out in the first couple of months and then they went a few more months without money and very little food. Some days, the only food they had was given to their young boy. They lost a lot of weight and were near starvation themselves. 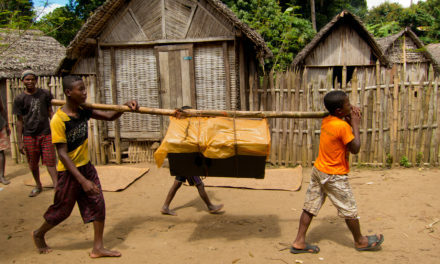 They eventually had to come back to their families in central Madagascar. 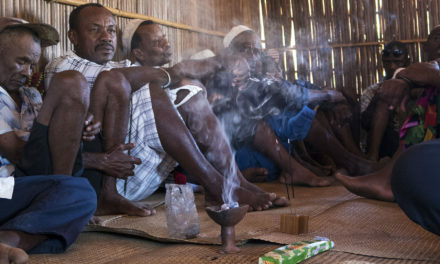 They’re still looking for work, which is not easy to find in Madagascar. 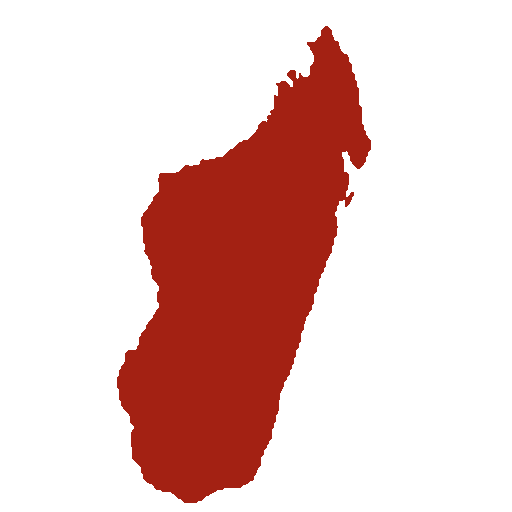 The government is unstable and Madagascar is reported to have the world’s worst economy. 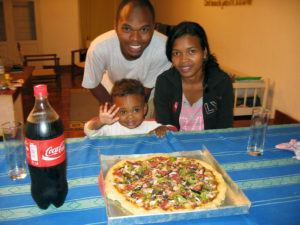 Our friends enjoying pizza at our house during her birthday. At least we’ve got the chance to feed them well! …All of this, and I had those petty thoughts running through my head! I was worried about stuffing my stomach full when so many others know what it’s like to go without any food at all. I was shocked at my selfishness and very disappointed in myself. At the end of our meal, though having eaten only half of my usual sized portion, I still felt surprisingly satisfied. These thoughts, however, began to open my eyes to the resilience of the Malagasy people around me as they deal with hardships on a regular basis. While making my way around town, I see people working hard for the food they will eat that day. A taxi-bus is stopped in the middle of a narrow road, blocking all other traffic. As we approach we can see the driver is under his taxi-bus trying to fix the problem with all his passengers still on board waiting. Sure, he’s inconveniently in the middle of the road, but you have to give him credit for trying! 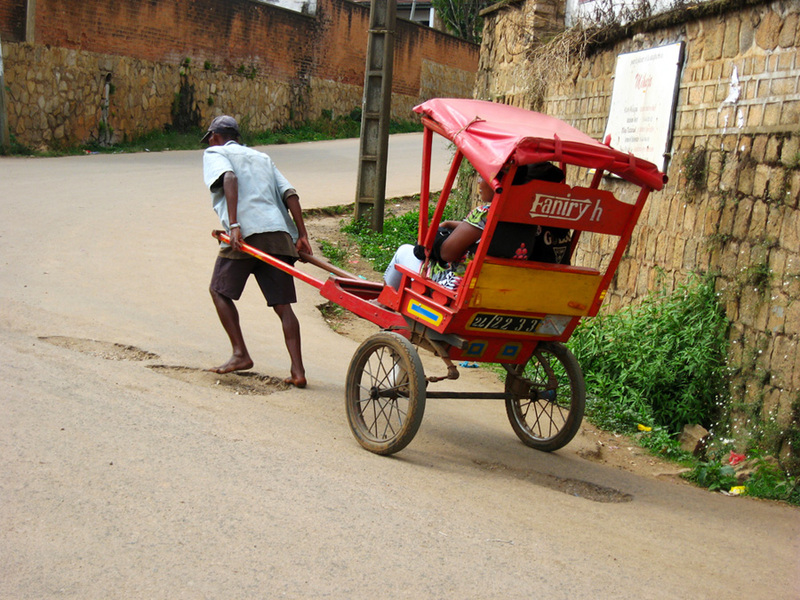 A typical “posy-posy” driver struggling barefoot uphill to carry his passengers. Another method of public transportation here is called a posy-posy. 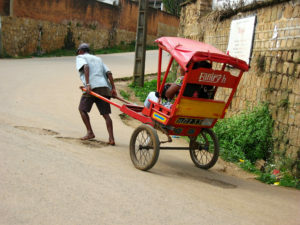 Basically it’s a rickshaw, a seat on wheels with the driver running along, pulling the people wherever they need to go. The drivers are often very thin and usually transport people across town, paved roads, potholes, gravel, everywhere – without any shoes! They can even pull whole families and people with lots of bags and luggage. Whether pulling uphill, on rough terrain, or in the rain, posy-posy drivers are always available, usually with a smile on their face as they offer you a ride, and the energy and effort they exert never ceases to amaze me. Like the posy-posy drivers, there are other men hauling weight by foot, but these are not carrying passengers. These are huge 2-wheeled wagons full of everything from gas containers, furniture, bags of vegetables and rice, to loads of charcoal stacked 10 to 15 feet high. They’re often pulled by one man or even three if necessary. Out of the corner of my eye I sometimes think another one of these wagons is passing by, only to realize that it is one man carrying it all on his back or his head! 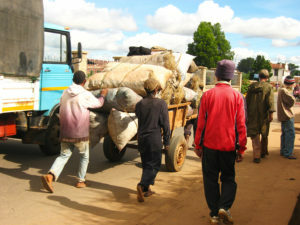 A few guys hauling a big load of charcoal along the road. All along the road, people are always busy cooking, repairing, and creating: making do with what they have. You can even find people working in their rice and vegetable fields right in the middle of the city along the rivers that cut past the road. And no matter how difficult the work seems to be, there always seems to be a lighthearted air about the people and you’re always greeted with a smile. Yet I know that what we’ve seen of Malagasy resilience over the past month that we’ve been here is really only just skimming the surface. Next year, when we move to the east coast of Madagascar and begin working in rural villages there, we’ll have experience of even more difficult hardships faced by Malagasy people. We’ll see firsthand what it’s like to have a home destroyed by cyclones and to have survival depend solely on the ability of the rice to grow well…another thought that puts my selfishness in check. Our friends’ visit came to an end just a week before Thanksgiving arrived. It was very lonely around the house and we wondered what we were going to do about Thanksgiving. 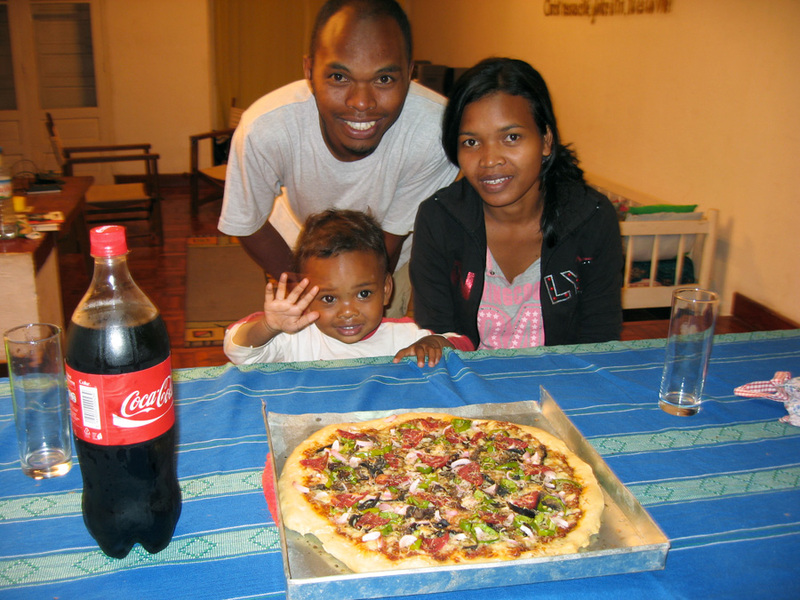 With our family being on the other side of the world and the friends we had here in Madagascar already gone, we didn’t have many options. I realized that cooking all of our traditional dishes wouldn’t be nearly as fun without people to share them with. It just wouldn’t be the same celebrating our Day of Thanks by ourselves. Then I realized we had an opportunity to invite another family who’ve also suffered many hardships. Soon after we arrived in Antsirabe, our city here in Madagascar, a young woman came by our house looking for work. But even after we told her that we had no work to offer, she continued to come by and visit with us every few days. Over the course of these visits she explained to us that her family was in a bad position and needed prayer. 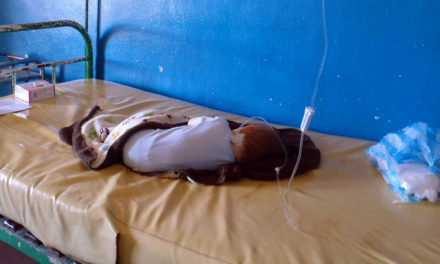 Her 17-year old sister had just had a baby and they had to use all of their small-business money as well as borrow money from many people just to pay for the hospital expenses. The people from whom they borrowed money were showing up every day and asking for their repayment. But with no work for anyone in this single-parent family of eight, it was impossible for them to repay their debtors. We heard from someone else that years ago their father suddenly disappeared and there were reports that he died in another city. It was their newfound faith in God that pulled them through these tough times so far. 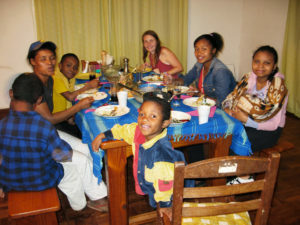 Our Thanksgiving guests this year – a full house! It made sense to invite this family over for Thanksgiving dinner. The mom helped us kill the turkey and Adam and I prepared food all day for our feast in the evening. We began the meal with all of us saying what we were thankful for, and despite what they have been through, they had a lot to say. It was wonderful sharing our meal with them and it put a lot into perspective for me. I’m reminded of Philippians 2:3-4 where Paul says, “Do nothing from selfish ambition or conceit, but in humility regard others as better than yourselves. Let each of you look not to your own interests, but to the interests of others.” In my case, maybe this means letting others eat more of my food, at least for a start. We’ve also had the opportunity to open our home again to our friends who first stayed with us. They’ve returned to try once more to find or make work for themselves, to do their best with what they’ve got. And we were able to give some financial support to our Thanksgiving guests, so that the mother could start her business again and begin to pay back their debtors. I’ve already learned a lot from the Malagasy people and their good attitude in the midst of hardship. Those little thoughts that crept into my head earlier were evidence of the situation we’ve been brought up in: one where there’s always more. Not only is there more, but the idea is that you need more. This makes it easy to focus on ourselves and our desires. Yet this Christmas and beyond, “…Let each of you look not to your own interests, but to the interests of others.” Let’s not think about how much more we want, but how much we already have. It shouldn’t be about the next great gift you want to have or even the next great gift you want to give. There is a lot of pressure this time of year and many people feel obligated to give gifts to everyone they know. But how meaningful is more stuff anyway, when we already have so much? Maybe your friends and family need more than a new gadget or product this Christmas. Maybe that’s not in their best interests. Instead think about how you can really be there for them, to be a support in their lives, to give them faith and a good attitude even in the midst of hardships. A panorama of fields in Antsirabe, taken from the main road between our house and the market. Thank you Lora for reminding us that the spirit of Christmas is not about the gifts. You are so lovely both inside and out! You and Adam always have a smile so I’m assured that you will have the merriest of Christmases with Matimu! All my love! Wow!! You two are cool people. I am nearly brought to tears every time I read something you guys post. I was moody last night because I had to fix my own dinner & was hungry. I feel like a jerk. By the way Nicole & I have a baby on the way. She’s about 12 weeks along. Anyway, keep posting because your gained perspective becomes mine as well. First off I would like to say terrific blog! I had a quick question that I’d like to ask if you don’t mind. I was interested to know how you center yourself and clear your head prior to writing. I’ve had difficulty clearing my mind in getting my thoughts out. I do take pleasure in writing but it just seems like the first 10 to 15 minutes are usually lost simply just trying to figure out how to begin. Any recommendations or tips? Kudos!